Take one look at your current sock drawer, and in the wise words of Aerys Targaryen, "burn them all!" Seriously, though. With holiday season upon us, Target has gotten a head start on releasing its 12 Days of Socks Advent calendars, and well, you're really going to want to make some room for this year's products. While Game of Thrones fans patiently await the eighth and final season of the beloved HBO show, Target's feeding our obsession for 12 straight days with its sock-filled calendar. Keep your feet warm for when Winter comes, because we can all agree that it's going to be a long one. The package features a mix of both low- and crew-cut socks adorned with your favorite Game of Thrones references and quotes. Think: "Mother of Dragons," "I Drink and I Know Things," "Hodor, Hodor, Hodor, Hodor, Hodor," and of course, house sigils. My personal favorite? The Carolina blue "Winter Is Coming" crew-cut pair. 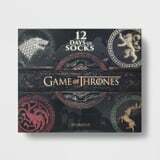 We have a feeling the Game of Thrones 12 Days of Socks Advent Calendar is going to sell out faster than Tyrion Lannister goes through a bottle of wine. Read on to purchase yours, and then, check out the ultimate gift guide for GoT fans.